So you’ve bought a BPA-free water bottle and ditched BPA-filled canned food. But BPA, a toxic chemical found in many of the products we use every day, may still be a big part of your life. So you’ve bought a BPA-free water bottle and ditched BPA-filled canned food. But BPA, a toxic chemical found in many of the products we use every day, may still be a big part of your life. That’s because massive amounts of BPA are found on many store receipts. And according to a recent study, BPA easily makes the transfer from receipt to skin, where it penetrates at such a deep level that it can’t be washed off. hand, the laboratory performed wipe tests on four BPA-laden receipts. BPA in the thermal paper. 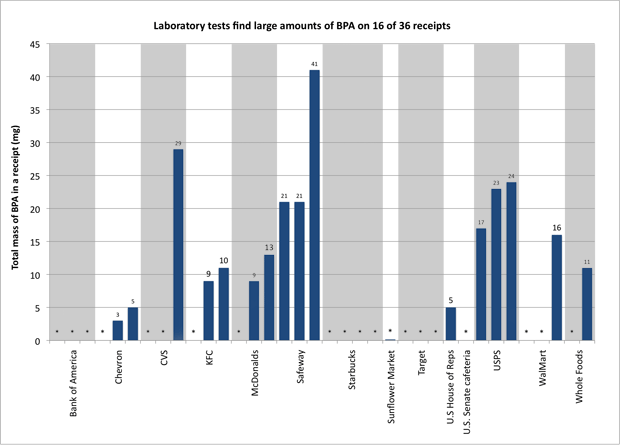 EWG’s test of 36 receipts from popular retailers yielded some disturbing results: BPA was found in significant levels in receipts from chains including Safeway, KFC, Whole Foods, Walmart, and McDonald’s. In all cases, BPA levels varied wildly from store to store. For example, Receipts from a KFC in Wheaton, Maryland contained 10.64 milligrams of BPA, while receipts from another KFC in Ames, Iowa contained just 0.0001 milligrams. The discrepancies exist because different stores use different types of receipts–some thermal paper manufacturers make an effort to produce BPA-free products. What’s a shopper without easy access to a BPA testing facility to do? 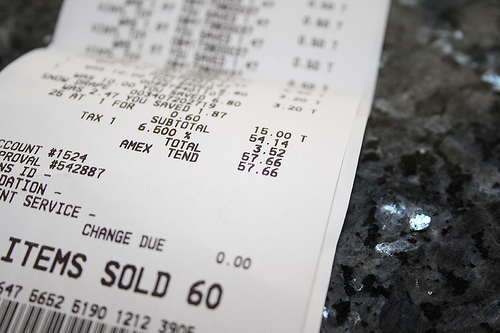 Employees at stores that use BPA-slathered receipts have little recourse, but consumers do have some options. Decline receipts whenever possible, wash hands after touching them (even though some BPA will still penetrate the skin), and keep receipts in separate envelopes. Beyond that, we can only try to pressure stores into ditching BPA-coated receipts. Reports like this one from the EWG should help.